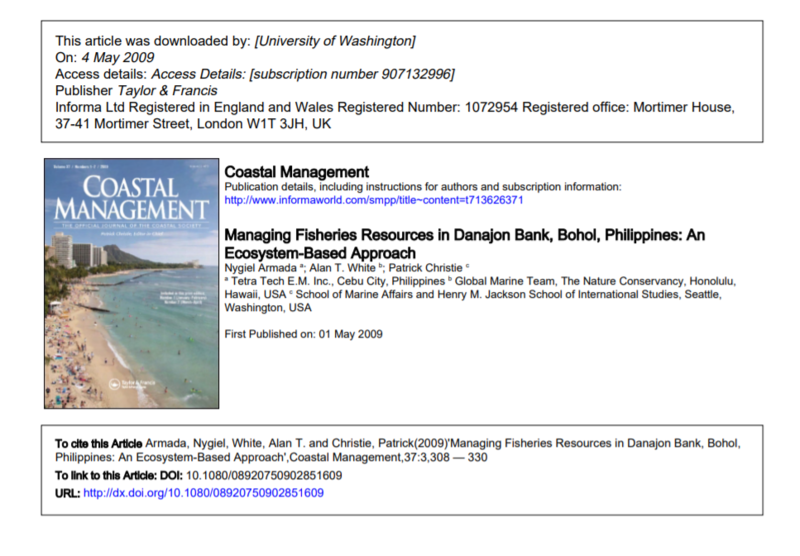 Abstract The Danajon Bank double barrier reef, located off northern Bohol Island of central Philippines, is the focus of this case study on ecosystem-based management (EBM). Fisheries management is relatively new in the area, particularly the aspect of managing fish stocks with wide distribution patterns crossing jurisdictional boundaries. Nevertheless, stakeholders are taking bold steps toward improving fisheries management. The impetus to take action comes from the realization that coastal habitats can no longer sustain the level of exploitation to which they have been exposed. The initiative is facilitated by the USAID-funded Fisheries Improved for Sustainable Harvests (FISH) Project in collaboration with various partners. The EBM approach of the FISH Project is incremental and builds on existing management systems and utilizes existing legal and institutional frameworks while encouraging progress toward ecosystem-wide management. Fisheries management tools include coastal management, marine protected areas, limitations on fishing effort and gear, control of extraction of specific life stages of important species, licensing, zoning, and coastal law enforcement. One FISH Project goal is to increase fish biomass by at least 10% in 2010 over the 2004 baseline. Monitoring data collected in 2006 and 2008 to quantify changes against baseline data for key indicators have generally shown incremental improvements based on fisheries independent surveys and MPA assessments. The Danajon Bank experience shows that there are three major components in working toward EBM: (1) fisheries management interventions should always consider a defined ecosystem boundary as resource management unit; (2) there is a need to understand the dynamics of marine ecosystems and how they respond to human-induced changes, particularly to changes resulting from fisheries; and (3), there is a need for a governance system that supports limits to fisheries resource exploitation activities. The match between the spatial range of the ecosystem and the governance system is the most important consideration and will play an important role in scaling up of fisheries management initiatives.